Like a butterfly on a summer breeze, love rarely lands where it’s expected. Working for her dad’s landscaping business stifles Linnea Ranta. When she’s invited to design and build a community garden with an intriguing master carpenter, she seizes the chance to unfurl her wings, but at what expense to her heart? Logan Dermott eases back his flirting when he senses Linnea’s fragility, but she has more backbone than he suspected. As they work together, Logan finds he’s falling for her, but it may be too late to win her love. Will Linnea break free of her chrysalis and fly away before Logan realizes what he almost had? 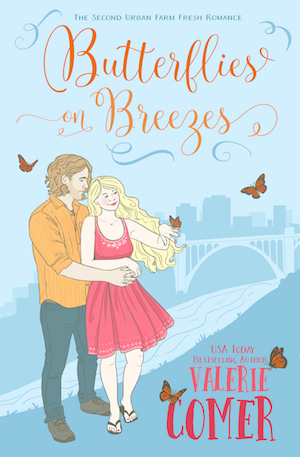 My thoughts: BUTTERFLIES ON BREEZES is the second book in Ms. Comer's Urban Farm Fresh Romance series, and it does stand alone, but readers will want to read the first one Secrets of Sunbeams to get story on the goat that is mentioned often in passing in this book. 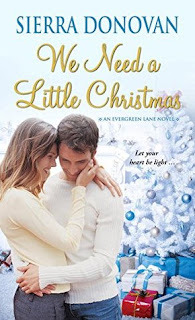 Logan is an accomplished pianist, and has been bitten by a wanderlust bug, but when he meets shy, sweet Linnea, he is tempted to stick around just to make her blush. It becomes more than a game when another guy asks Linnea out and Logan realizes maybe he does want her for herself. But he has to decide what is more important? Going where his itchy feet lead, getting a college degree and doing what he loves, or working construction just to be near Linnea. Decisions, decisions. Linnea does start out as sweet and shy, but by the baseball game she's knocked out of the field and does a complete one-eighty on the personality scale. Suddenly she's standing up for herself, moving out, moving on, and making decisions and making an enemy out of her dad and oldest brother. I hated her making decisions against her parents/family and causing relationship problems, but it does end well. I didn't come to care for these characters as much as I wanted to, but it was nice to see plans for a community garden coming to life and watching these two young people find their wings and begin to fly. Warning for the conservative readers, there is some drinking (wine) involved. If you like sweet romances, then BUTTERFLIES ON BREEZES is a book to consider. Mitch, a contractor and house-flipper, is restoring a beautiful old house in an idyllic Midwestern neighborhood. Angela, a woman filled with regrets and recently transplanted to his area, is anything but idyllic. She's almost his worst nightmare, and she's also working on restoring something herself. As he struggles to keep his business afloat and she works to overcome mistakes of her past, these two unlikely friends soon discover they have something unexpected in common, a young mom who is fighting to give her children a better life after her husband's incarceration. While both Mitch and Angela are drawn to help this young mother survive, they also find themselves drawn to each other. Will a lifetime of regrets hold them back or unite them and bring redemption along with true love? Restoring Love, part of New Hope Publishers' line of contemporary missional fiction, demonstrates how God can turn our greatest tragedies and failures into beautiful acts of love and grace that can impact the lives of others. Readers will connect with the realistic characters and find they can relate to the complex situations that makes Jennifer Slattery's book so appealing. Readers will be inspired to see how God wants to use us to restore people's perception of love in action. My thoughts: RESTORING LOVE is the first book I've read by Ms. Slattery, but if this is any indication of her writing skills then it certainly won't be the last. I wasn't real sure what to think of the book when I opened it and started reading. It is women's fiction more than a romance (though there is a romance included) and women's fiction isn't really my favorite genre. But then, the story reached out and grabbed me. I liked Angela, and even though she probably dressed in appropriately for an "old" woman (she isn't really old, but to a woman who's young enough to be her daughter, maybe she is) she had a fun sense of style. I'm glad she went for more modest when she changed her wardrobe, but I hope she kept her colorfulness. Mitch-- a true hero. I loved him. But he was also a string that was unfinished. I wonder what happened with him, with his business, with his son. I'd like to know more about him. I could relate to so much in his life. Like his son. Bianca-- not a woman I was fond of, but my heart hurt for her and the impossible situation she found herself in. I was so glad she had Virginia, Mitch and Angela in her life. I LOVED this book! And I will read more by Jennifer Slattery. 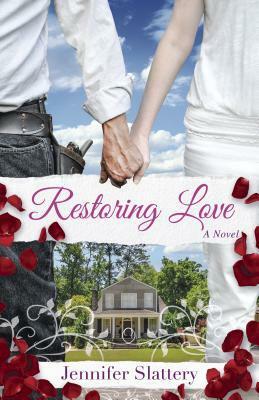 If you haven't read RESTORING LOVE it is the perfect book for a new year. I was given a free copy of this book. All opinions are my own. Life has not been fair to Jenna Davis. After losing everything she considered her world three years ago, her only hope has been holding on and trying to survive. When she finally decides she must find a way to go on with life, she boards a plane destined to visit a friend across the country. But she hadn’t counted on meeting a handsome stranger and his young son on the flight, nor could she have prepared herself for what life would throw at her next. Can Jenna find love again after tragedy strikes or is she destined to go from one tragedy to another forever? Scott Browning was devastated when his marriage broke up. With his young son, Lane, he is learning to pick up the pieces and go on with life. On his way home from a visit to his parents, Scott meets a young woman who will change everything, just before his own life is thrown into question. Most couples think about love at first sight. Could this one be love at first death? 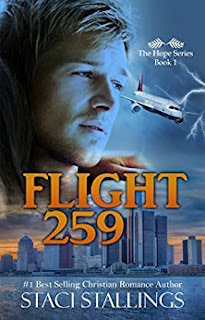 My thoughts: FLIGHT 259 was part of the Whispers of Love romance collection (which I am a verified buyer of) but it dissolved and the authors published separately. I am reading these stories slowly (as I have time) as there was like eleven or twelve different stories in the collection. Jenna and her mom don't get along and Jenna doesn't even try. I think she could've been a lot nicer to her mom, but she wasn't. It didn't exactly endear Jenna to me, even though she was sweet as sugar to everyone else and went above and beyond. I do understand Jenna's grief, I also understand her mom. Scott is not the most understanding Dad in the world, and he, like his dad had anger issues. I understand the get it done mentality that most men have, and the lack of patience with kids. Okay, the accident - this is pre-9-11 so the airport, airplane scenes are not exactly up to current - but it is realistic to the 1990s. However, I fail to see how a laptop case is strong enough to keep a grown man lodged into his seat so that a woman had to swim back to rescue him. I had to suspend belief there and in several other places. Overall, it was an engaging story - would they survive? Would they get together? Would Scott and his ex-wife reconcile? Will they make peace with their parents? It was edge-of-the-seat at times. Not the best story I ever read. Choppy at times. Lots of different point of views. But not the worst story either. Definitely engaging. I bought this in the Whisper's of Love collection. I was not required to write a review. Sam Cooper is about to get the surprise of his life. His parents plan to leave Harper’s Inlet and move to Louisiana, where they will open a bed and breakfast. When the family arrives, Sam’s cousins have some pretty wild-eyed stories to tell about a “haunted” mansion nearby. He and his cousins begin exploring the creepy place. Where were those noises coming from and the strange lights at night? There is also a rumor that the reason this place is “haunted” is because there is buried treasure hidden someplace. As the cousins are investigating, Sam’s parents have been looking for an available property they can afford. Sam was in for another surprise when he found out about the rundown mansion his parents finally chose to buy. Who is trying to discourage them from moving in and why? Will the family be able to open the bed and breakfast before it’s too late, or will they lose all their money? My thoughts: GHOSTS IN THE OLD ATTIC is the sixth book in Mr. Anderson's tween boys series, but it stands alone. I read all the books in it except two. Mr. Anderson was the author that helped my youngest son to enjoy reading and even though he writes mainly for reluctant boy readers, girls enjoy his books and my reluctant reader youngest daughter is engaged by his books. GHOSTS IN THE OLD ATTIC started slow, but picked up. I figured there was a mystery in there somewhere and there was. I liked the ending, and didn't find the book particularly scary (though a tween might). 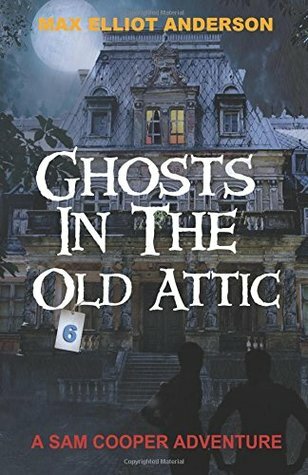 There are a lot of ghost stories included (which definitely appeal to tween boys) and of course a possible buried treasure ... sure things that will appeal to the reluctant male tween reader on your list. I received a copy free. All opinions are my own. When Kristen Esh loses her mom in a tragic accident months before her 18th birthday, she suddenly finds herself among Amish relatives she never knew she had. The dramatic change from the Jersey Shore to remote upstate New York is difficult enough, but abiding by the Amish rules and lifestyle is a challenge unlike any other. When anonymous notes begin to arrive for her to go back to where she came from, Kristen longs for her past life and her mom. As she discovers secrets that unravel her true identity, she finds an unlikely ally in John Wagler, the step-son of her aunt. He lessens Kristen's fears and encourages her faith. Interwoven with gradual revelations is the growing love between Kristen and John. One that encourages forgiveness and helps seal Kristen's fate. My thoughts: THE STRANGER is Ms. Maran's debut novel, and fans of Amish fiction will likely love it. Kristen is English and when her mother dies, she is basically sent to live with Amish relatatives that she never even knew existed! Culture shock set in, as Kristen is an ultra-modern teen from the very upscale Jersey Shore and upper state New York is about as far from that as you can get culturally. John is Amish, and is about the only one accepting of Kristen at first. He befriends her, and helps her as she tries to unravel the mystery, and discover her ancestry. But what will Kristen choose? Will she return to her known and loved world? Or stay in the one she's been thrust into and comes to love? I've been Ms. Maran's critique partner for years and watched this story go from it's beginning rough drafts to this well-written polished version that you will find at your favorite bookstores. A coming of age story for Kristen, mixed with a light romance and a mixing of mystery, this is a book that Amish fiction loves will flock to. 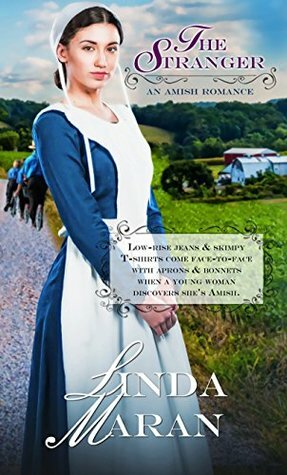 The Amish setting in the story is a real life area only about an hour and a half from Ms. Maran's vacation home, so she visits the area often. You can feel her familiarity with the areas in the style of writing. Entangled, a contemporary romance about surrendering regret, will be a free eBook on Amazon December 26-28. This is book two in her Surrendering Time series, but it can stand alone. Entrusted, the first book in the series, is a free eBook at http://juliearduini.com. The Surrendering Time series is an entertaining yet reflective adventure to the Adirondack Mountains. Each book takes an element of time (past, present, future) and explores through flawed and humorous characters what a surrender journey looks like. In ENTANGLED, Carla Rowling has been given her dream of attending cosmetology school. The gift is so generous she feels unworthy because of choices she made as a teen. The pressure mounts as Carla juggles school, is a single mom, helps her best friend Jenna plan her wedding, spends time with boyfriend Will Marshall, and deals with the fact that her son's father is back in their lives. Will Marshall is the one Speculator Falls resident everyone can count on. His truck deliveries are reliable. He's the first to help friends like Ben Regan with boat work or be a card partner with Bart Davis. Will's ready to settle down with Carla, loving her is natural. He's bonded with her son, Noah. But when Carla starts cosmetology school, she puts emotional distance between her and Will. Julie Arduini loves to encourage readers to surrender the good, the bad, and ---maybe one day---the chocolate. She’s the author of ENTRUSTED: Surrendering the Present,ENTANGLED: Surrendering the Past, and ENGAGED: Surrendering the Future. FINDING FREEDOM THROUGH SURRENDER is her 30 day devotional using the surrender themes and characters from the series. She also shares her story in the infertility devotional, A WALK IN THE VALLEY. She blogs every other Wednesday for Christians Read, and also is a blogger for Inspy Romance. She resides in Ohio with her husband and two children. Learn more by visiting her at http://juliearduini.com, where she invites readers to subscribe to her monthly newsletter full of resources and giveaway opportunities. My thoughts: WE NEED A LITTLE CHRISTMAS is not a Christian Romance, but it does start with a funeral and has a few mentions of a Christian song (Leaning on the Everlasting Arms) and a pastor who makes a mention or two of God. Liv is a very take charge individual, organized, and in control. She hates falling apart at her grandma's funeral and is crushed she hasn't taken time to visit her family in four years. Her sister is pregnant, but feeling insecure and unneeded since Liv is taking charge and bossing her, and her mom is healing from a fall where she broke her ankle. With the funeral and cleaning out of grandma's house, there's a lot of taking charge to do and organizational skills needed. Scott is a handyman and seems to be a daily call for Liv's family as the house seems to think it needs to keep Liv and Scott thrown together. A new furnace that won't work...when you want it to, but will come on when it's off, a trap door that closes without warning, and more. I like Ms. Donovan's books usually, but this one felt a bit slow and draggy. The usual sparks are missing, and characters I liked in her previous book act a bit like jerks in this one. I did hurt for Liv. Scott seems like a fun type guy but he didn't move beyond that for me. If you like Christmas books that are not Christian, then WE NEED A LITTLE CHRISTMAS might be a good one to consider. I bought a copy of this book, but not from amazon. I won't show up as a verified buyer there. I was not obligated to write a review, and all opinions are my own. 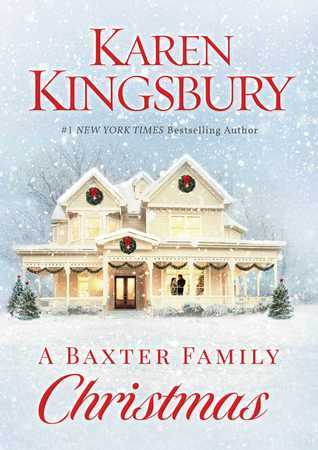 Whether you’re meeting the Baxter family for the first time, or finding them all over again…A Baxter Family Christmas will leave fingerprints on your heart forever. 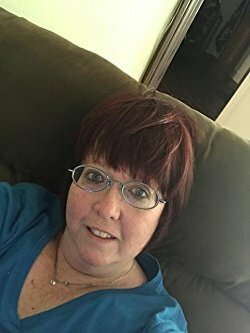 My thoughts: I'm going to be honest here and tell you that this is the first book in the Baxter Family Saga series I've ever read, I have read one or two Karen Kingsbury books, decided she's a stellar writer but I don't like to cry through my books so that pretty much was when I backed away. 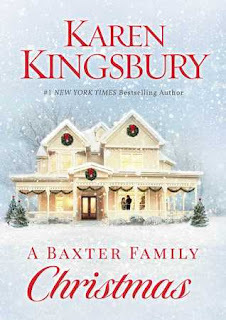 Then I saw the cover for A BAXTER FAMILY CHRISTMAS and it looked so inviting and welcoming and I had to read it. So, I did. At first I kind of felt like an unwelcome guest. I didn't know these people. I didn't care about them, and there I was sitting at their dining room table involved in a terribly intimate conversation about a heart transplant and how they'd like to meet the reciprocate. Wonderful. But that meant someone died. Who? Why? How? I did keep reading and I grew to care about the characters in this book (I probably won't go back and read the other books, but I enjoyed the time I spent with the Baxter family in this family saga. I especially liked the fledgling romance forming between two teens and how the Christmas Eve family gathering ended. Sweet. I got a copy of this book off Netgalley. All opinions are my own. 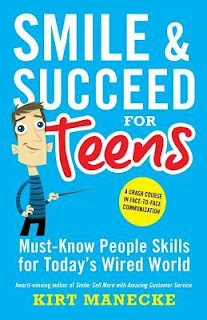 Smile and Succeed for Teens is a must have for teens who want to make a good impression on interviewers, make a good impression on the job, and succeed. This is available in paperback or in ebook form. Smile and Succeed for Teens is written by a sales, marketing, fundraising, and business development specialist with over thirty years experience. Smile and Succeed for Teens is packed with indispensible tips, proven techniques, and “must-do-now” strategies and if followed could generate success in school, work and life. Ø Quickly and easily master the people skills critical to your success. Ø Communicate effectively with people. Ø Improve confidence and self-esteem. Ø Turn off the technology (and feel good about it). Ø Master customer service, sales, and fundraising skills. Ø Interview like a pro and get the job. Ø Ask for the sale or donation—and get it. Ø Make a powerful first impression. Smile and Succeed for Teens is a must read for teens (and even young adults) who are job hunting. This book would be an excellent addition to a personal library, public libraries, homeschools, as well as Christian and public schools. An invaluable guide to getting a job and making a great impression Highly recommended. Hayley Wolfe shares a kinship with the lost and lonely. Growing up without a father taught her that you can't always count on people. Her strong faith in God taught her that her Heavenly Father is unshakable. When she meets Kameron Kohl at her antiques and coffee shop, she's immediately drawn to his warmth and charm. After being abandoned on the steps of a church as a baby, Kameron Kohl has spent his life rejecting God and meaningful relationships. After all, his own mother didn't care for him, so why should anyone else. But Kameron never expected to meet Hayley Wolfe. Her faith in Christ, her inner beauty and selfless openness towards strangers, has Kameron falling for her hard. When Hayley notices a connection between Kameron's keychain and the locket passed down to her from her mother, she wants to investigate further. Kameron refuses. As friendship turns to love, Hayley will have to rely on God to soften Kameron's heart. My thoughts: CHRISTMAS TRINKETS is the first book I've read by Ms. Peery, but I enjoyed it. A sweet romance, this story will have you rooting for Hayley and wanting to sit Kameron down and tell him exactly how he's been blessed and he's not as abandoned as he thinks he is. I loved the strong faith message in this book. And the matching trinkets Hayley and Kameron have were a slight mystery. I enjoyed CHRISTMAS TRINKETS and recommend it for anyone wanting a Christmas novella to read this holiday season -- or any time of the year. You may have thought you knew the lives of famous people―such as Martin Luther King Jr., Howard Hughes, Mother Teresa, Muhammad Ali, Ronald Reagan, Susana Wesley, and many more. But, in The Book of Amazing Stories, you’ll know so much more about Ronnie’s faithful church-going single mom and William’s early days as a humble shoemaker’s apprentice. You’ll marvel at how God used the lives of these ordinary people to change the course of human history. Life makes the strangest sharp turns and, sometimes, U-turns. Robert Petterson―popular speaker, storyteller, and author―has been a student for his entire life of what God is teaching us through those real-life U-turns. 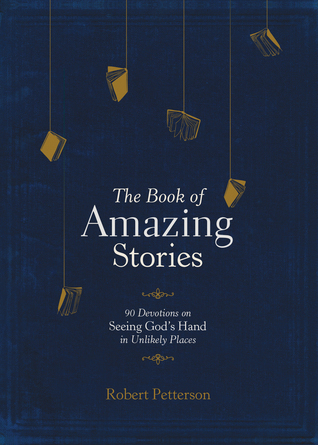 In this book, he compiles 90 amazing stories that teach lessons you won’t easily forget. Each devotional ends with a compelling thought about life and God. Be amazed. Be encouraged. Learn the lessons God is teaching through people’s lives. My thoughts: Many years ago there was a public speaker, who became known for his story behind the story radio spots. I think he also wrote books. And now you know the rest of the story... I think maybe you might know who I'm speaking of. Paul Harvey. Anyway, THE BOOK OF AMAZING STORIES reminds me of that old radio show. It takes well-known people, such as Mother Teresa, Ronald Reagan and others to show you how they got to that spot, provides an application that you can apply to your own life, and gives a Bible verse that kind of relates to the story. If you know someone who likes amazing stories, then THE BOOK OF AMAZING STORIES would be an excellent gift this season -- or any time. Why I Didn't Rebel - and #Giveaway!! !